This year saw the humble turmeric grab the spotlight on an international stage ! The 'haldi-wala doodh' reinvented itself as the gourmet showstopper aka the 'turmeric latte' . Long relegated to the kitchen shelves of every Indian household, the western world is warming up to the superfood status of this miraculous spice. The fact that it possesses a beautiful burnished hue is a major factor behind it's culinary appeal to the West. When scouting for Christmas recipes, this wonder ingredient was on mind all the time. I wanted to incorporate the beautiful hue and aroma of turmeric in my cake but in a manner which is very different from the Sfoof, a Lebanese tea cake. This cake draws it's inspiration from the 'Enduri pitha', a steamed dish from Odisha which is very similar to the Konkani 'Patholi'. It is infused with the sweet aroma of the turmeric leaves, cardamom and coconut. Interestingly, coconut cakes are an important part of the Christmas celebrations in the tropical countries like Sri Lanka and even Australia. Preparation - Sift all the dry ingredients together. Add the ghee, sugar, condensed milk and curd a mixing bowl. Whisk gently till the sugar is dissolved. Fold in the dry ingredients taking care to whisk in the same direction. Finally fold in the grated coconut. Line the baking tray with the turmeric leaves. Apply a thin layer of ghee on the leaves. Pour the batter into the baking tray. Baking - Pre-heat the oven at 180 C for 10 mins. Place the tray in the oven. Bake at 180 C for 35-40 mins or till a toothpick inserted into the middle comes out clean. Invert onto a cooling rack and remove the turmeric leaves. Once it is completely cool, put into pieces and serve. 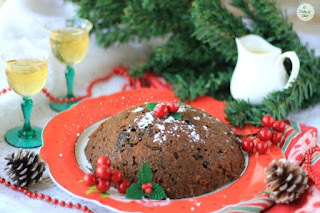 Christmas Pudding with brandy sauce !! Something the veggies will be happy to try out.